Suffolk non-league side Bungay Town are offering free punnets of mushrooms to supporters who attend their home match against Martham on Saturday. The offer is part of Non-League Day, when clubs try to boost fan numbers. "We have a supplier of mushrooms so we thought 'why not? 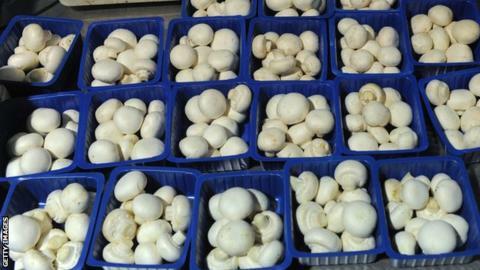 The former chairman is a mushroom grower'," vice-chairman Shaun Cole told BBC Sport. Last season, the Anglian Combination Division Two side gave fans 5p to attend their game on Non-League Day. "Last year we had a 60-70% attendance increase on the day and I would be delighted if we can get that again," Cole added. Non-League Day day was set up in 2010 by James Doe as a way of highlighting the importance of affordable volunteer-led community football. The event has become an annual part of the football calendar during an international break and is backed by both Premier League and Football League clubs. Premier League players both past and present, such as former Southampton midfielder Matt Le Tissier and current Hull defender Curtis Davies, have given their support to the day. Teams across the country are reducing costs of match tickets on Saturday and many more are offering special deals in a bid to attract fans to games. Matches at Blyth Spartans, Dulwich Hamlet, Lewes and Marine will all promote anti-discrimination group Kick it Out, with fans being given flags, badges and wristbands to support the organisation. Elsewhere, Conference side Kidderminster Harriers will be giving out free children's books whilst Truro City are handing out free scarves with the combined logos of both Truro and opponents Hitchin Town. Read more on Non-League Day - what is it?